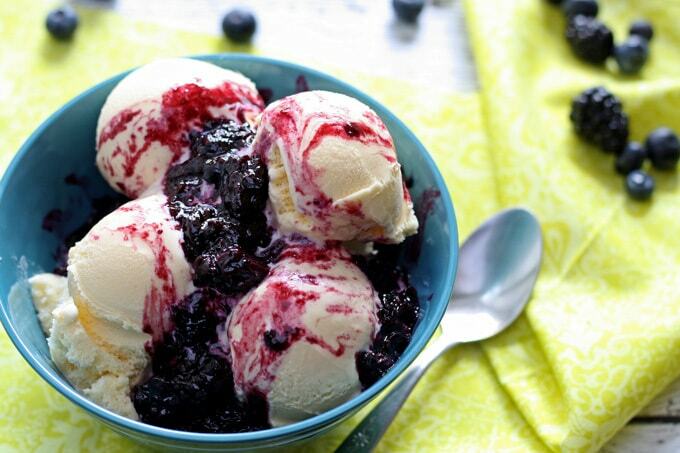 If you’re craving dessert but don’t want leftovers, try this recipe for berry compote for two. It’s perfect over ice cream and pie! Mr. B and I like dessert. As you can imagine with the amount of baking I do, there is often a surplus of sweet goodies in our vicinity. I sometimes get on a baking kick and then we are swimming in cookies, or cupcakes. Or both. Then, to counteract all of the sugar, I send us to a dessert desert for a little bit. Our doctors thank us but we get sad and quickly miss sweets. I am pretty sure that is actually some kind of sugar withdrawal. 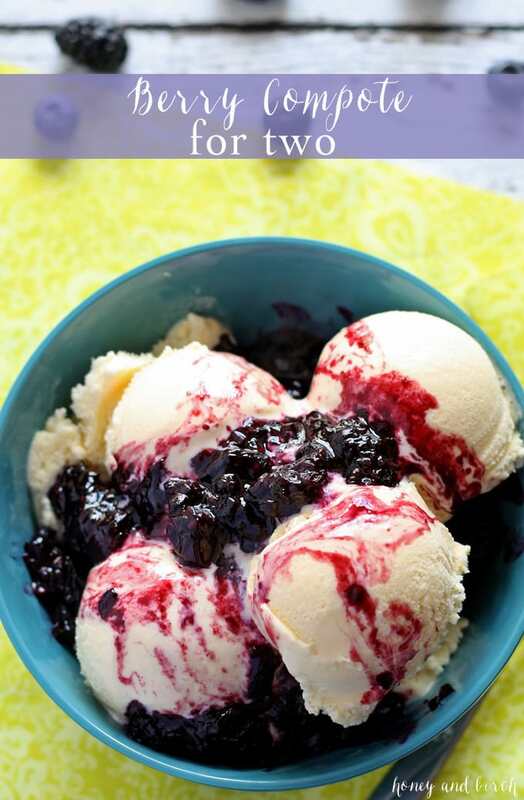 Instead of caving in and make a dozen cookies, I have started making “dessert for two.” It’s hard being a two human, one canine household – I imagine if we had kids that they and their friends (and friends’ parents) would help eat some of the sweets. Instead, we beg neighbors to take them off of our hands. Mr. B will occasionally bring them to work and I’ll cart some with me to client appointments but some inevitably gets thrown out. It’s so sad. My solution to this occasionally making smaller batches of things that we love. 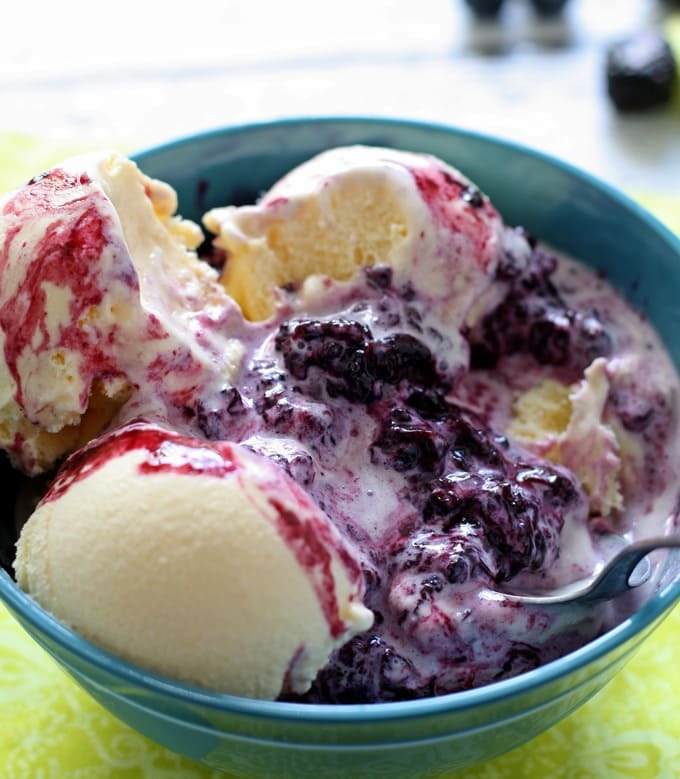 Like berry compote to top ice cream! This ice cream topper is very easy to make. So easy, you will want to keep berries in your fridge every day in case a sudden craving arrises. 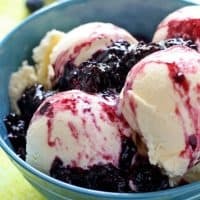 We happened to have blueberries and blackberries laying around but you could also substitute raspberries or strawberries that have been diced up. Everything gets put into a pot and brought to a boil. Then you let it simmer until its thick and the berries are macerated. At this point, you will want to eat it very badly, because the smells emanating from the pot will cause your sugar cravings to kick in. 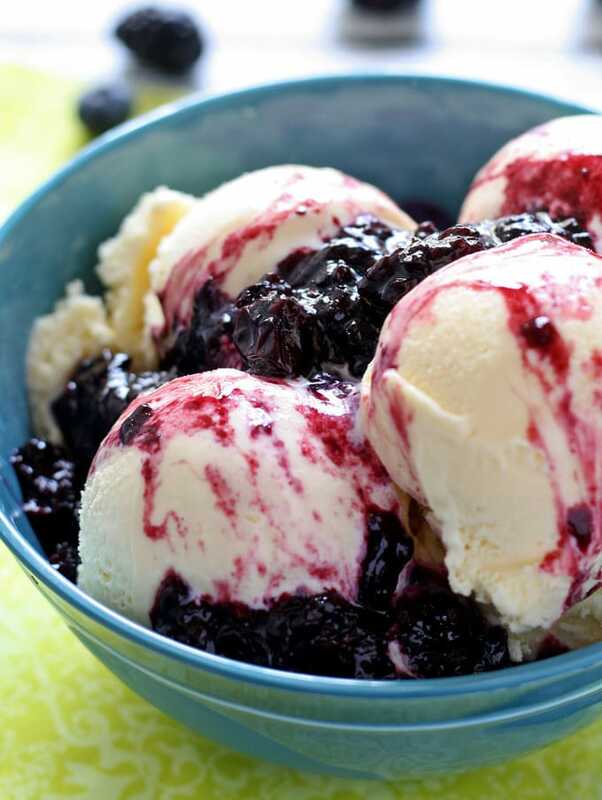 If you're craving dessert but don't want leftovers, try this recipe for berry compote for two. It's perfect over ice cream and pie! Combine all ingredients in a small saucepan and stir to combine. Bring to a boil over medium high heat. 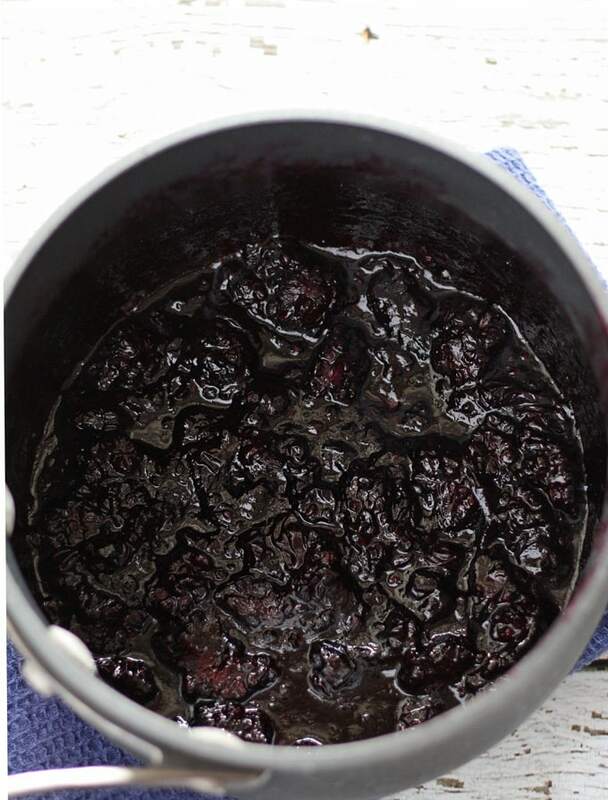 Reduce heat to medium and simmer for 10 minutes, or until the liquid has reduced by 75 percent and the berries are in a thick sauce. Stir frequently. Serve hot. My goodness, that gif really got me. This is my idea of guilt free – so what about the ice cream, there is fruit and therefore it doesn’t count as dessert! Lol, I couldn’t resist making the gif! Fruit definitely cancels out the ice cream. Looks delicious!! We are a two human two canine household too. This looks perfect for the two of us! Pinning! Have a terrific week Jenny! If I ate everything I would need to buy new clothes every week. I keep trying to get different people over to “taste test” so less is wasted. Lol, Michelle – I keep going back to the gif over and over. I love berry compote!! 🙂 I try to have some in the fridge all the time, especially in spring and summer!! You did a GIF! Aren’t they fun to make?? Now I really want to have some ice cream too! This is a great recipe for me to use on my chia pudding! I can’t tolerate regular dairy but this would be great with my coconut milk chia pudding! Thanks! Oh my gosh, this would be delicious on chia pudding – thank you for the suggestion!! This compote sounds so good! I bet it would be delicious over some Greek yogurt for breakfast. ohh i love berries! what a great idea and such a simple topping to add to everything from cookies to yogurt! Thanks for sharing with Snickerdoodle Sunday! This just SCREAMS summertime goodness. Luckily I am in an area that has early summer. YUM! Wow this looks so yummy!! 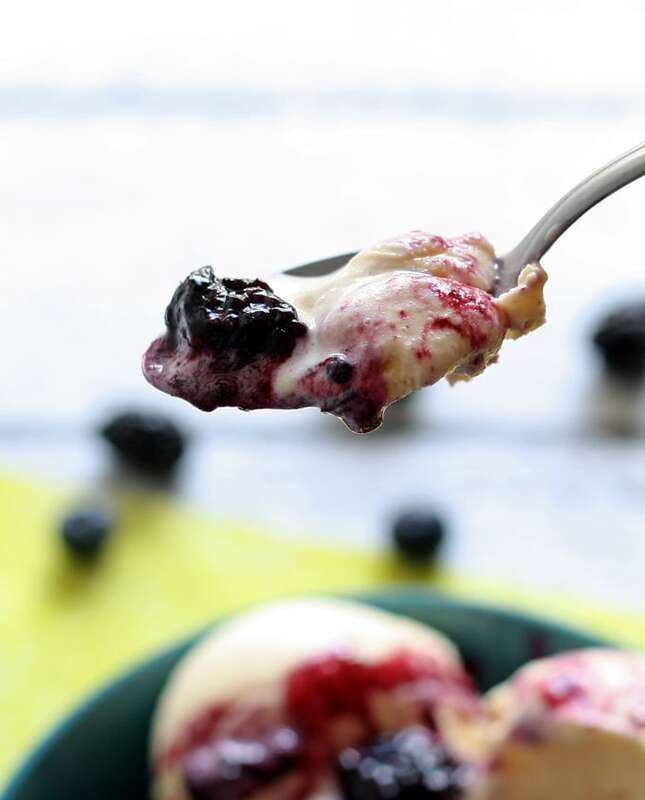 The family loves to have ice cream in the fridge, I have been sneaking in frozen yogurt instead, this would be the perfect topping, pinning so I can pull it up at the grocery store for ingredients! Thanks! Thanks for pinning Nikki! I hope your family enjoys it as much as mine does! Thanks for linking up to Tasty Tuesday, I’ve pinned this great recipe to the Tasty Tuesday Pinterest board.